What is the Spirulina? Spirulina is the blue-green algae. It is a primitive plant form. The Spirulina’s structure is close to the living things which existed billions of years ago. Some scientists like Christopher Hills, Ph.D., D.Sc., calls the Spirulina vegetable plankton. The color is greenish blue. The name of Spirulina came from the Latin word spiral. Originally, Spirulina resides and grows naturally in the lakes of Africa, Peru, and Mexico. 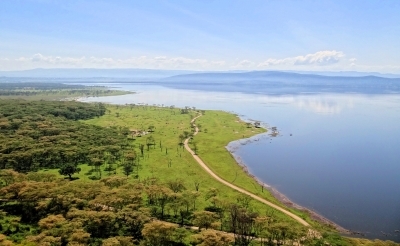 The Spirulina found in the lake Aranguadi and Chiltu in Ethiopia, in the lakes Elementia, Rudolf, Nakuru (in the picture above) in Kenya, in the lake Johann in Chad. Lake Buccacina in Peru contains Spirulina. The algae grow naturally in the Lake Texcoco in Mexico. People, who live by these lakes, use Spirulina as food. Flamingos, beautiful birds, continually enjoy this vegetable plankton. 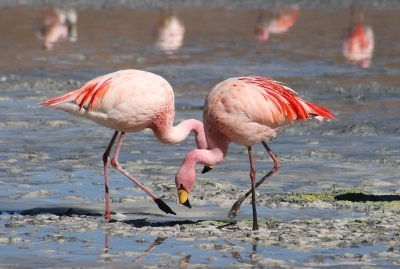 Do you know that the algae cause long legs of flamingos become pink? I wonder maybe they are gorgeous and skinny thanks to Spirulina? What is the Spirulina? The Spirulina is the unique algae. Why? The Spirulina contains minerals, proteins, amino acids, vitamins, chlorophyll, ferments, phycocyanin, and analog to coenzyme Q 10. Minerals are iron (Fe), iodine (I), calcium (Ca), sodium(Na), potassium (K), copper ( Cu), magnesium (Mg), manganese (Mn), zinc ( Zn), phosphorus (P), selenium(Se), vanadium(V). Vitamins are thiamine( B1), riboflavin(B2), pantothenic acid (B5), pyridoxine (B6), folic acid(B9), A ( a group of unsaturated organic compounds such as retinol, retinal, retinoic acid and few of provitamin A carotenoids), E ( a group of compounds, which include tocopherols and tocotrienols), C ( L-ascorbic acid), PP ( Niacin or vitamin B3). Spirulina has ribonucleic acid (RNA) and deoxyribonucleic acid (DNR). Spirulina contains chlorophyll. The chlorophyll is the source of organic iron. Phycocyanin, which found in Spirulina, may stop the growth of harmful cells and improve the immune system. The Spirulina called the food of future. The spectrum of the therapeutic usage is broad. The Spirulina recommended as the nutritional supplement which gives you all active and needed material for recovering and strengthening of the body. Christopher Hills, Ph. D., D. Sc recommends using Spirulina for health protection. Prevention is the best way to protect ourselves from unpleasant consequences when our well-being starts to shake up. In the book, Secrets of Spirulina Christopher Hills Ph.D., D.Sc. shows examples where Spirulina helped his patients. 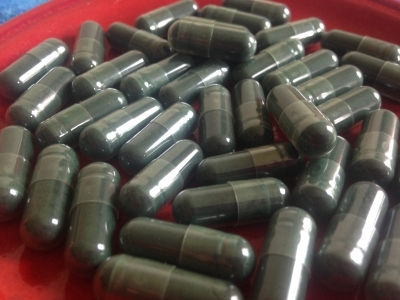 Anemia, liver problems, diabetes, pancreatitis, gastroenteric disorders straighten up with the support of Spirulina. The example of vast improvement when the patient experienced hair loss documented in this book The Secrets of Spirulina. It seems that Spirulina supplied nutrients and encouraged the growth of hair. It did not happen as the patient was hairy again, but it was a darkening effect of the downy hair.The darkening effect recorded on the silky white hair. Spirulina is balanced and delicious with vital nutrients substance. People who lived by lakes used and use Spirulina as the source of food. This superfood used for hundreds of years, and it is safe to eat. According to Christopher Hills, Spirulina can help humanity to survive and have Spirulina as the staple food. I think that it is an excellent message to people who want feel well and live balanced lives. There is countless evidence of documented results by users of Spirulina and health professionals. The book Whole Truth about Spirulina, edited by Wendy Fulcher contains letters of people who used Spirulina. Users share their joy and contentment when they write about results using Spirulina. I think that people must decide what is best and use their minds. Nowadays the Internet is available for everybody, who can read. Google is a great companion when we search for information. Lots of interesting information here on Spirulina. I’ve taken it on and off for years, but I must confess…I do not love the taste of it. I usually try to mask it in juice as I prefer to take the powdered variety as opposed to pill form. The reason being because I believe if you can actually ‘taste’ something it’s more beneficial than by-passing the tongue straight to the gut. Thanks for your great post. Hello, Jackie, how are you? Thanks for comment. I do not taste Spirulina when I use it. I take it as capsules with water. I know that some people are sensitive to outer wall of capsule. Adding Spirulina to smoothies can soften the taste. The lemon and powder of cacao, pineapple and banana can make great drink where you will not feel the taste of Spirulina at all. Wow. I love the amount of research you did here on Spirulina. I just checked out your other post on the health benefits and I must say again I like how informative you are. I never knew Spirulina regulates blood pressure that is a good thing to know since I have a family history of high blood pressure. Thanks for the article! Hello here. Spirulina does a lot good things such as detox, replenishing body with vital minerals. I did not see any side effects from sources, just that Spirulina is not not recommended for people who have kidney problems. Spirulina has high amount of protein. Overall, it is a great source of vitamins. It does not have great taste but putting in smoothies or taking with yogurt works pretty well. Thanks for all the useful information on this amazing natural food which we all would benefit consuming. Spirulina has been a staple food source for many ancient civilizations including the aztecs and mesoamerican people. As you rightly say, those living by the sea used it as a staple food source. This is the kind of diet we should be looking at to get the population back into a healthy regime, instead of all the junk food that plagues are dinner tables now. I think the idea of eating seaweed kelp and algae sounds abhorrent to most people and this is part of the problem. Hello, Ches, thank you for the comment. Spirulina is a perfect food for everybody. I wonder why people do not use it. It is cheap, has nutritional value and improves well-being. I think how money would be saved if Spirulina would change staples of food such as a meat and poultry. Animals graze and after it they need to move to another pasture. For Spirulina we do not need big expenses such as transporting, feeding and producing products from animals. I use Spirulina as dietary supplement because I do not want to put Spirulina in hot dishes.Vitamins and enzymes would loose their effectiveness. Spirulina has strange taste, especially if we consume more of it. I put Spirulina in smoothies mixing with banana, pineapple and lemon. Sometimes I add some of mango, chia seeds. I actually use spirulina in my own home in vegetable drinks that I like to make. It was recommended to me by a friend and I like it. I never knew it had all of these benefits though. I never take much at a time because I heard that you don’t need a lot and too much can be bad for you. Do you know what a recommended daily dosage of this in a powdered form would be? Hello here. I researched few books regarding dosage of Spirulina and I found out that from 2 to 8 tablets which weight is 500 mg each, is a safe dosage for adults. Of course, everybody is different. It is advisable to talk with dietitian or doctor who knows what Spirulina is. I met plenty of people who never heard about this algae. It is okay, maybe they do not need it. Christopher Hills in his book the Secrets of Spirulina described the acute toxicity test with animals. He states that as long one does not ingest 225 gm., no toxicity is exhibited. These 225 gm would be approximately eight oz. It is a big amount of Spirulina. I hope that people know what they do. Otherwise, we can suffer from overconsumption of sugar from soda when we drink too much of it.